Fairfield, CT Trademark Fairfield at 665 Commerce Rd. is a unique transit oriented, mixed-use development including 101 luxury apartments and 13,860 s/f of ground-level retail space. Working with vision and determination through the Transit-Oriented Development (TOD) zoning change, Trademark is co-developed and managed by Abbey Road Advisors, Skala Partners and ELV Associates. Recognizing the unsatisfied demand for new and contemporary multi-unit housing in Fairfield, the developer incorporated structural and design elements intended to encourage and increase density and provide a mix of uses on the site. Breaking ground in March 2016, the developer began delivering units to residents in June 2017. With over 70% occupancy today the developer anticipates stabilization (95% occupancy) by April of this year. The building includes studio, one-bedroom, one-bedroom-plus-den, and two-bedroom units. Built on 2.5 acres on the site of a former gym, Trademark Fairfield recaptures former flex and industrial space creating a project off the highway and within walking distance of the Fairfield Metro North Train Station. Walking pathways to the train station help to create a sense of community and sustainability. The development caters to commuters, empty nesters, university professors and administrators and a variety of millennials. 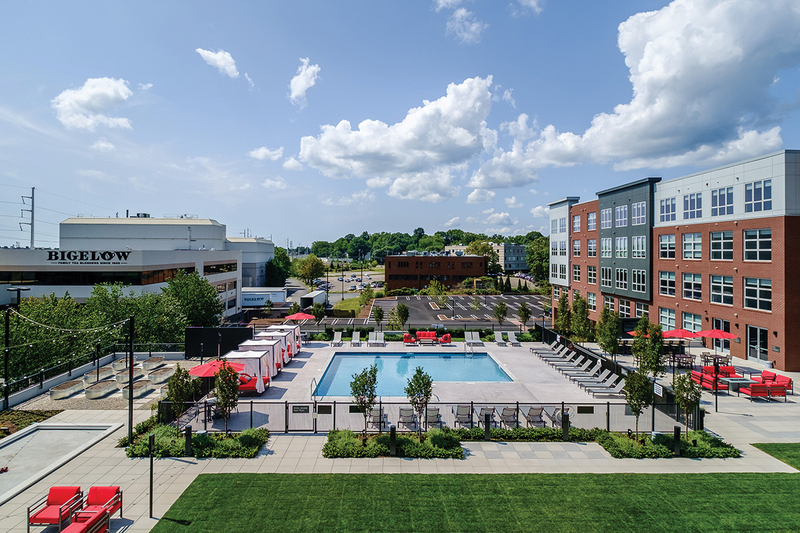 Offering a 2nd level outdoor pool and cabana area with a large screen television, fire pit, permanent barbecue grills, bocce court, and raised garden beds for tenant’s “urban farming,” Trademark positions itself as a “best in class” transit-oriented development. 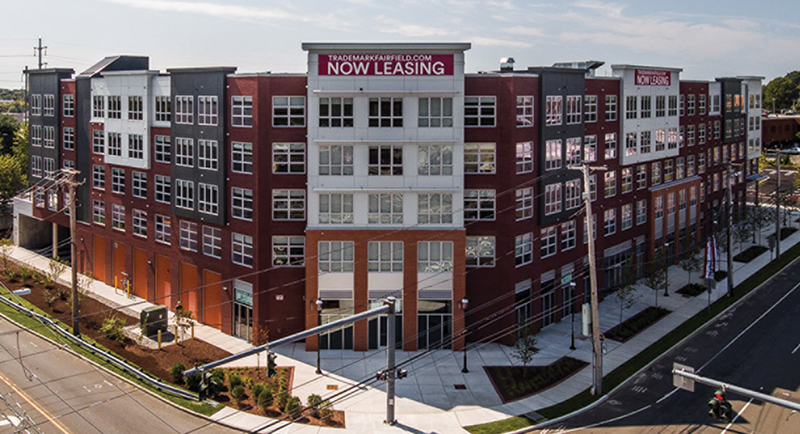 Completing its appeal to the broad range of residents, Trademark provides bike storage, a club house, private conference room, fitness center, electric car charging stations and individual storage units. Saugatuck Commercial Real Estate (SCRE) of Westport, Conn. was selected as the developer’s exclusive retail broker for the project and was pleased to sign their first commercial tenant in fall 2017, Barbacoa Smoke House. Barbacoa is a Mexican-focused barbeque restaurant owned by Nigel Bradley, will occupy 4,159 s/f and plans to open to the public in March. Current negotiations continue with a gourmet market and several smaller amenity, financial and personal services. Leveraging their success with Trademark, partner Abbey Road Advisors recently submitted an application to the Town of Fairfield for Phase II - a mixed-use “sister” project at the corner of Kings Highway and Ash Creek Boulevard that will include 160 residential apartment units, approximately 13,000 s/f street-level retail, and a 480-space structured parking garage. Phase II will be identified as 1401 Kings Hwy. and like Trademark will feature conversion of largely industrial areas into luxury product. The site is 4.66 acres and is made up of five different parcels, and includes existing office buildings at 777 Commerce Dr. and 1375 Kings Hwy. Another building at 1383 Kings Hwy. will be demolished to make room for the redevelopment. The site is adjacent to the Fairfield Metro North Train Station and will be linked to Trademark via the walkways weaving through both properties. Plans include additional amenity services for daily commuters who walk or bike to the train station from surrounding neighborhoods. Phase II of the development will carry the streetscape and sidewalk improvements down Commerce Dr. and around the corner to Kings Hwy. and all the way to Ash Creek Blvd. Planned improvements include decorative street lighting, fewer curb cuts, public benches and bike racks, improved landscaping and additional street-level retail offerings. SCRE will continue to exclusively represent the developer for retail space in Phase II. SCRE is licensed in Conn., N.Y., Mass., R.I., N.H. and Fla. and is nationally recognized as a Women Certified Business Enterprise (WBENC). SCRE represents retail and office tenants, landlords, developers and investors in leasing, sales and investment transactions. For additional information about SCRE visit www.saugatuckcommercial.com.